The word 'printer' seems too humble for most of the all-in-one devices currently on the market, which sprout full-colour LCD menu and photo preview screens, memory card slots aplenty and high-resolution scanners for photocopying. Some, like the Lexmark S405 and Epson BX305FW add functionality for the home or small office, including direct fax facilities complete with an ADF (Auto Document Feeder). But what if you just want a straightforward Wi-Fi printer/scanner that you can use from all over, without all the extra bells and whistles? The new Canon MP495 might be just what you're looking for. Considering its asking price of just £60, the Canon MP495 has a decent specifications list. 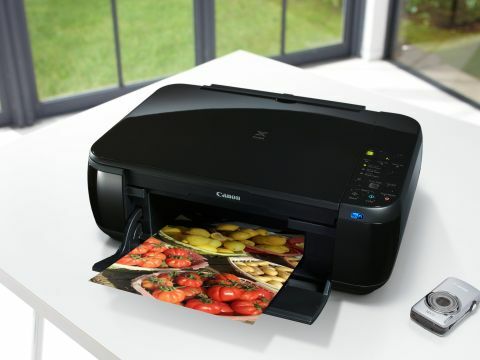 A 4800dpi print engine running on Canon's latest ChromaLife100+ pigment and dye-based inks is coupled with a 2400dpi scanner to enable one-touch mono or colour photocopying, as well as printing or scanning from anywhere around the home thanks to Wi-Fi connectivity. But look a little closer and you'll spot a few omissions. Unlike practically every all-in-one printer on the market, the MP495 has no LCD screen, not even a basic mono text display. All you get is a few LED indicator lamps and a single-digit numerical display for setting photocopy quantities between 1 and 9. With a distinctly limited set of onboard controls, you also have to connect the printer to a PC to enable Wi-Fi set-up and configuration, and there's no PictBridge port or any media card slots, so direct printing from cameras or memory cards is out of the question. Another potential drawback is that, while even tri-colour cartridge stalwarts like HP and Lexmark have moved to individually replaceable ink cartridges in recent models like the HP Photosmart Plus and Lexmark S405, Canon has kitted out the MP495 with a black pigment-based ink cartridge and a tri-colour dye-based cyan, magenta and yellow cartridge. In normal use, if you use each of the colours in fairly equal quantity, running costs aren't all that steep at 3.5p per mono page and 8.2p for colour (using the optional high yield cartridges) but if you print a lot of one particular colour, costs can be significantly higher. Print speeds proved pretty average in our tests at 15 seconds for a mono text page and 23 seconds for a mixed text and colour graphics DTP page. Standard quality photo output actually proved 15 seconds quicker than with the more up-market Canon MG5150, at one and a half minutes for a borderless 6 x 4-inch photo. Photo quality itself, however, is relatively poor, with a lack of contrast and depth, although colour rendition is reasonably accurate for a four-ink printer.